World Cancer Day (Monday 4th February, 2019) is an international awareness campaign led by the UICC, the Union for International Cancer Control. World Cancer Day is the one singular initiative under which the entire world can unite together in the fight against the global cancer epidemic. Cancer is a global challenge. In 2018, 18 million people world-wide were diagnosed with cancer. And every day in the UK, 27 people are diagnosed with leukaemia and sadly half will lose their fight to leukaemia within 5 years. 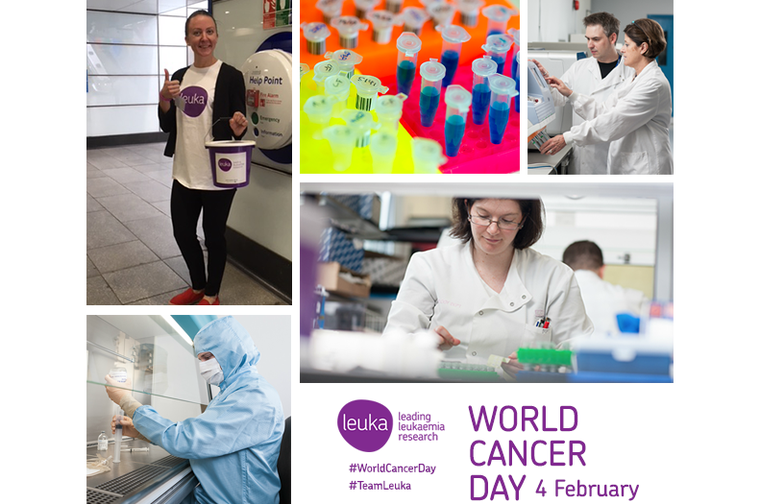 Leuka is the UK’s leading leukaemia research charity – every day we support ground breaking research that is saving lives. We are able to fund this research thanks to the generosity of our supporters who every year donate, fundraise and remember us in their Will to help end leukaemia. This year’s theme is #IAmAndIWill, encouraging individuals and organizations to declare how they are contributing to World Cancer Day and working to create a future without cancer. And don't forget to tag us in to your tweets at @leadleukaemia! Share your story with us, sign-up for a fundraising adventure and join in our 'I AM, I WILL' cry for action.